There were two teams that left Kulusuk at the same time. Ours and an international team led by Charlie Paten, an ex Royal Marine. Both teams are traveling on the same permit so we’ve been climbing the glacier together these last few days. Their team consists of George, an American who worked as a relief doctor in the aftermath of the Sri Lanka Tsunami; John, who is cycling from England to New York – unfortunately, Greenland is not that well suited for bikes so he’s skiing acros instead; and two Belgians, David and Gert, who are snowboarding first ascents around the world. They’re a good bunch and great for morale. The day progressed resonably well, it is taking longer to get out of the crevasse zone than expected but we should surely be in the clear tomorrow. We’ve had to endure a couple of pretty hairy crevasse crossings, some so deep they simply descend into darkness. Its on everyones mind when we cross the snow bridges, will they hold my weight, will the sledge fall through and take me with it? Thankfully, we’re all safe. The repairs made to Pat’s sledge didn’t hold too well, it took on water and everything got soaked. So we brought it into the tent in the evening and spent 3 hours drilling holes and bolting on bits of plastic using the most basic tools. We’re prety confident this will hold now, at least if the terain gets better. It’s quite energy zapping so we’re all quite tired and just looking forward to finally being able to put our skis on. 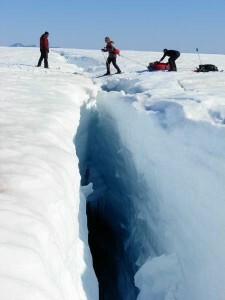 This entry was posted in Greenland and tagged Charlie Paten, Crevasse, Jonathon Bradshaw, Pulk. Bookmark the permalink.